For the one-shot manga of the same name, see Digimon Story: Cyber Sleuth (Manga). Digimon Story: Cyber Sleuth (デジモンストーリーサイバースルゥース, Dejimon Sutōrī Saibā Surwūsu) is a video game. It is the fifth entry in Digimon Story series and a part of the Digimon Adventure 15th Anniversary. It was originally released exclusively for PlayStation Vita in Japanese on March 12, 2015. For the international release, it was then localized and ported for PlayStation 4, and was released along with the original PlayStation Vita version. The localization retains the Japanese audio track. 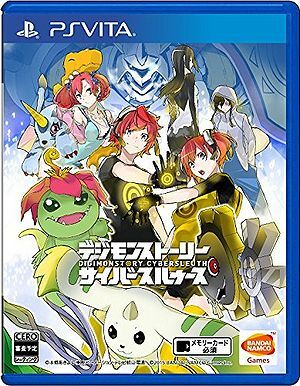 The PlayStation 4 version was released in Japanese in 2017 along with the sequel and the sixth entry in Digimon Story series, Digimon Story: Cyber Sleuth Hacker's Memory. The game also received a manga adaptation. ↑ 1.0 1.1 1.2 1.3 1.4 1.5 1.6 1.7 1.8 1.9 Cannot be obtained without DLC or clearing certain DLC-only Quest. ↑ 2.0 2.1 Only available on English version by pre-order DLC bonus. ↑ 3.0 3.1 3.2 3.3 3.4 3.5 3.6 Only available on updated Japanese, English, and Chinese versions by Patch 1.04 starting on October 10, 2016. See Gallery:Digimon Story: Cyber Sleuth. Producer Habu Kazumasa 羽生 和正 "Digimon World Re:Digitize"; "Digimon Adventure"
Character Design Yasuda Suzuhito ヤスダスズヒト "Durarara!!" Illustrator; "Yozakura Quartet"
New Creature Design Ōgure Ito (Oh!Great) 大暮 維人 "Tenjou Tenge"; "Air Gear"; "Biorg Trinity"
Music Takada Masafumi 高田 雅史 "Danganronpa"
In the "Problems At Digipedia" case a Wikipedia for Digimons is mentioned and its called Digipedia. Digipedia is the real world name for the german Digimon Wiki. In the splash page for the title of the eleventh chapter of Digimon Universe Appli Monsters, it can be found a book titled デジモンストーリー CS (Digimon Story CS). On September 15th 2017 the game got a free patch which added German subtitles for both the PS4 and PS Vita. This page was last modified on 26 March 2019, at 02:42.